I'm working on a few little projects for JD's dinosaur birthday party next month and wooden crates are on the top of my list. I've searched high and low for rustic wood crates that are reasonably priced without markings, but haven't had much luck. So instead I decided to make my on, well kind of. I purchased these mini wooden crates at my local Daiso Japan ﻿Store (where everything is only $1.50) a few weeks ago and this weekend I began the very easy process of staining them. The mini crates did have a bit of writing on them, but I was able to get rid of it by rubbing them with sandpaper. 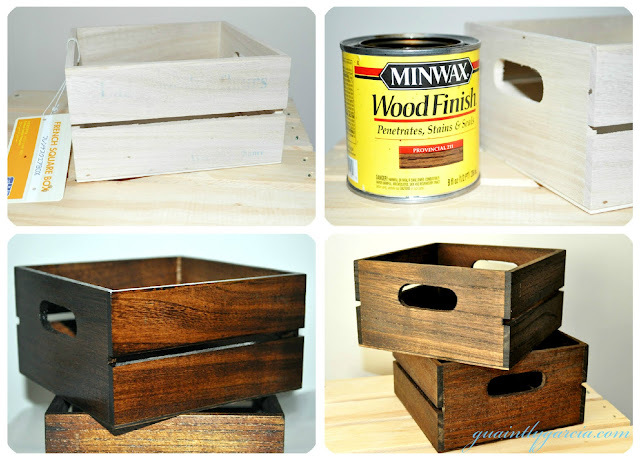 I stained each crate with MINWAX Wood Finish in Provincial and a few hours later I had mini rustic wood crates for under $2 a piece! Thank you! I'm stopping by tomorrow, I'll grab a few for you!